Fast track entrance to the Sagrada Família. 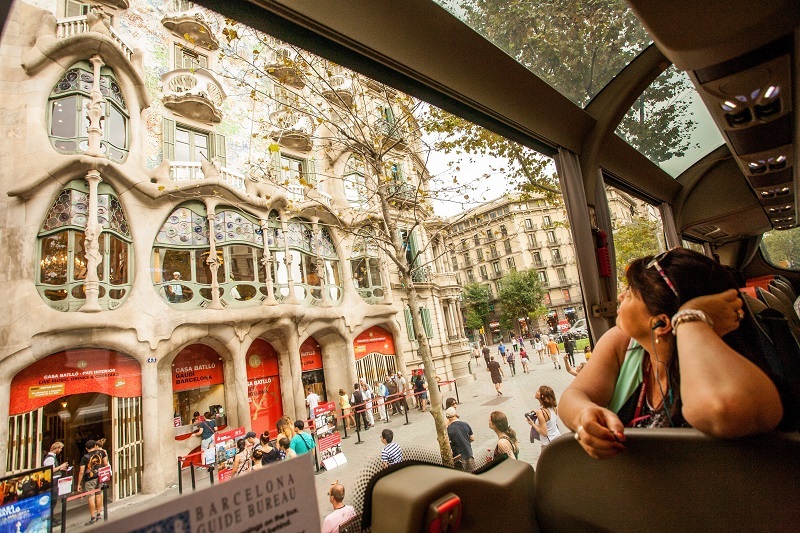 Relax in a comfortable bus while a friendly guide reveals Gaudí’s world of fantasy and geometry. You will start with a drive along Passeig de Gràcia avenue, which has two of Gaudí’s most famous works: Casa Batlló and La Pedrera. 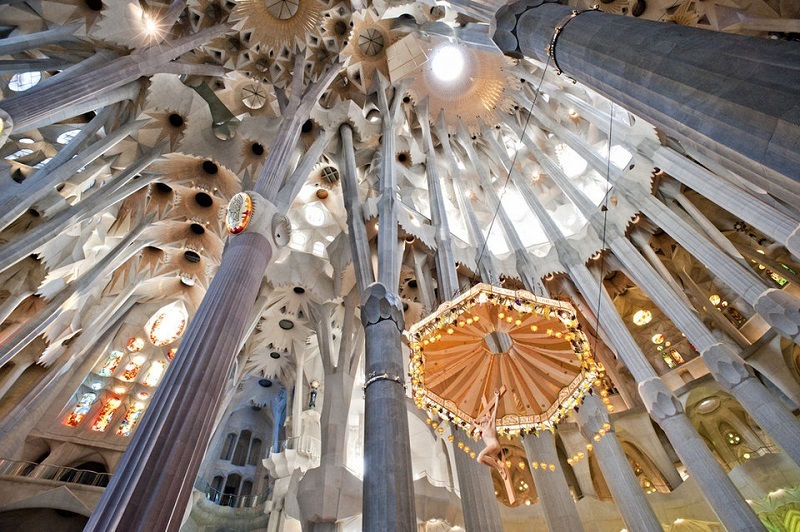 You will then go towards the Sagrada Família for a guided tour and some free tour. When: Daily at 10 AM all year round; and at 3 PM, except Sunday, from April 1 to November 2. Language: English. This tours is also available in French from April. 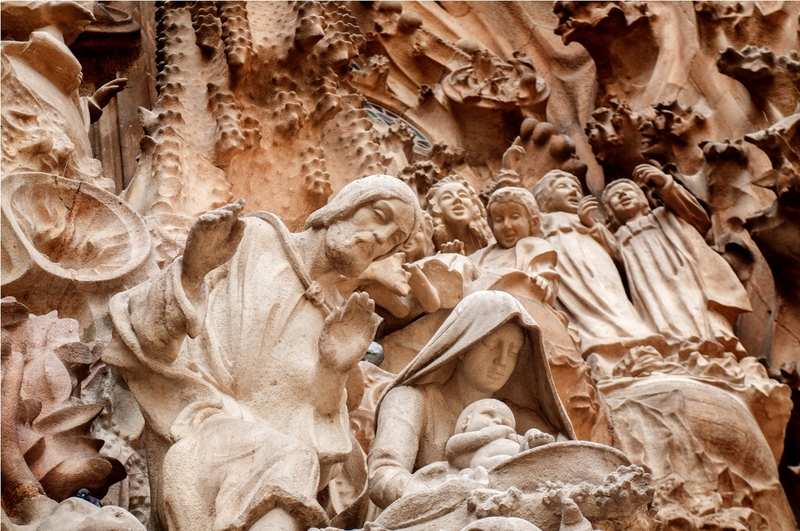 Include: Guide, transport and entrance fee to Sagrada Família (worth 18€). Transport: Comfortable roomy air-conditioned private bus. Please note that all our coach tours involve some light walking. Itinerary: Plaça Catalunya > Passeig de Gràcia > drive past the façades of Casa Batlló and La Pedrera > Eixample > Sagrada Família guided visit + free time > Plaça Catalunya. Fast track entrance to the Sagrada Família. Sagrada Família is at the end of the tour, so you can stay on and savor the building for as long as you like. Entrance tickets and fast track to Sagrada Família. Food and drinks. There is water available in the bus for 1 €. Antoni Gaudí was a visionary architect during Barcelona’s modernista period early 1900. 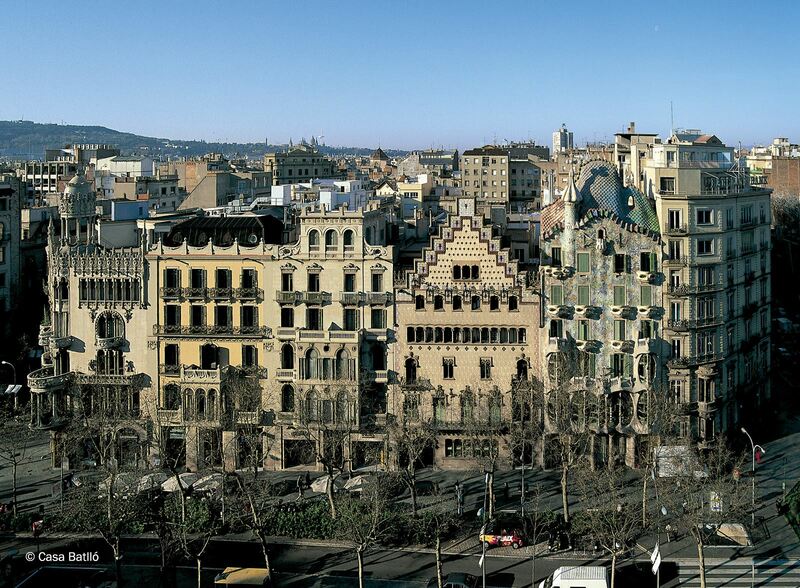 He graced Barcelona with nearly all its extraordinary buildings. 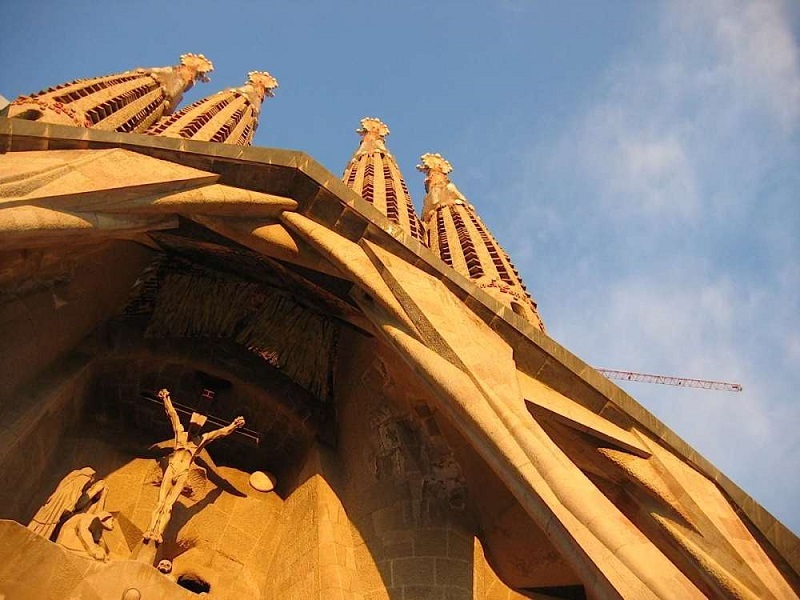 No less than 7 have been listed as World Heritage Sites by UNESCO, including Sagrada Família and Casa Batlló. Open your eyes, heart and mind – wonder at how Gaudí used nature as his source of inspiration, you will find that what seems like chaos is actually based in sophisticated mathematics. Each detail is full of surprises waiting to be discovered. You can choose to do the morning tour at 10 AM or afternoon at 3:15 pm. Yes, we balance the tour with some free time in Sagrada Família. And if you are hungry for more, you can always stay longer at the Sagrada Família, as that is where the tour will end. This is a new bus. It is not only comfortable, but also has a low emissions engine. This means we help reduce the air pollution in Barcelona and reduce the CO2 climate change emissions. The absolute maximum is 40 people. Will I hear the guide easily? Yes, we use a radio-guide whisper system. You will listen to the guide directly from your earphones. This is also a neighbor-friendly measure. We are not loud but talk softly through the radio-guides, giving some peace to the people who live nearby. "We especially enjoyed the Sagrada Familia church"
Irina Sytcheva was an excellent guide, explaining sights in detail but keeping our interest. We had a small group so were pleased the tour was still held, and this way we received very personal attention. Kudos to our driver who navigated us carefully and safely through a couple very narrow roads with cars parked on each side. Very interesting tour and jam-packed with information. I believe it's a must for anyone visiting Barcelona. To appreciate it fully you have to have a good guide. Our guide was Amaia. She was fantastic. She almost squeezed all the history and landmarks of Barcelona for us on this trip. She also gave us plenty of advice and recommendations on what to do and where to eat in Barcelona, making our lives easier. La Sagrada Familia is indeed a masterpiece with lots of details in every corner. There's a story behind every design and color. As an Egyptian, i'm usually hard to impress by architecture given all the history we have in Egypt. But amazingly enough, I was much impressed by La Sagrada Familia. If you decide to go, my key advice is to pick your guide. They can definitely make you appreciate the work of Gaudi. I also recommend you combine this tour with the Montjuic visit to cover more in one trip. "Sagrada Familia tour with Eva"
This tour completely blew my hair back. The Sagrada Familia is absolutely amazing and set the tone for my trip to Barcelona. Walking through the Basilica and listening to the tour, given by Eva, was almost like having a conversion experience. Eva was great, she brought the stones to life by matching the stories of the Basilica's interior with it's two intricate exterior facades. She also described the relevant history and background of Gaudi's life. She's approachable and easy it's easy to speak with her. (Her English is great). This tour is perfect for kids or adults. I went by myself and had an absolute blast. Obviously, this is a church, so be prepared to see the gospel written in this building. Muy recomendable! Hemos tenido una magnífica visita gracias a la guía Irina. Nos ha encantado. We were VERY SATISFIED and will always book with you! We had a fabulous tour with Philip as our guide on Friday, December 15. He was extremely knowledgeable and made sure we saw as much as possible. We were with a Viking Cruise and very glad we took this fascinating tour. Thanks, Philip!!! Terrific opportunity (on Easter Sunday) to see Sagrada Familia church. Guide was outstanding, bus from central location was fine, but the walk to the church nearly finished us. All in all, it was a wonderful experience and our best tour in Europe. Next time I'll turn back the clock and arrive in Europe 10 years younger! Fantastic tour guide (Aida) really bought Barcelona and Gaudi to life for us – wished we had booked more tours with BGC and will do so when we return. She was funny, informative and really welcoming, and the short coach journey to Sagrada Familia was full of really great snippets of information. Sagrada Familia was breath-taking, nothing we'd heard about it before did justice to the stunning interior. Again, Aida was fabulous with her explanations about the architecture and the symbolism used by Gaudi – what a wonderful way to spend a couple of hours. Thank you! Arriving between Christmas and the New Year and without any preparation I was disappointed to find the the tickets to see Sagrada Familia were sold out until the Saturday which was the day we were coming home. I have used getyourguild before in Amsterdam so looked it up online and was delighted to find tickets available with a guide for the next day. The guide used audio equipment which was just brilliant and she was extremely knowledgeable, very pleased with the whole experience from booking to rendevous and the guided tour we would definately book again and would encourage others to book! The visit to the Sagarda Familia was great in all means! It was well organized, on time, a very high class bus and most important- our guide Anna Lluisa was very professional, with wide knowledge and sensitivity to the group level of interest and differences in age and language. There is no doubt we could not enjoy our visit so much without the facilitation of GBG. The guide is very informative and I learned a lot about Sagrada Familia. Thing I wouldn't have known if I chose an audio guide or went by myself. We used Barcelona Guide Bureau on our recent trip to Barcelona. 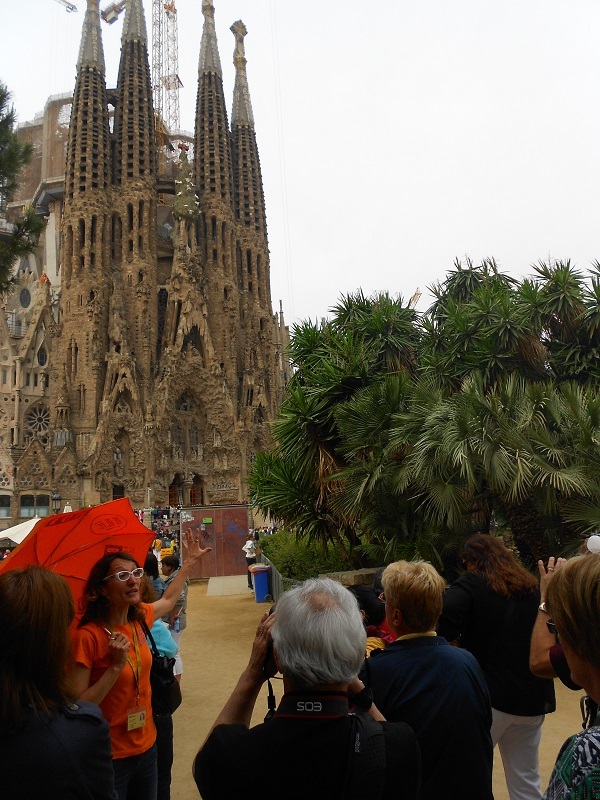 We went on two tours: the Gaudi/Sagrada Familia and the Gothic/Picasso Museum tours. Both tours were excellent. The guides were knowledgeable and pleasant. It was a great way to see the city and I would highly recommend it. We booked the Sagrada Familia tour before leaving for Barcelona, and we're glad we did it. The guide was very knowledgeable, and explained everything about the church, and why it was built the way it is. It was very interesting. We were also given the option to stay on longer after the tour, to explore further and shop for souvenirs, and the guide advised us on the best way to get back home. It was overall a great experience, and I would recommend it to friends. I would recommend this Sagrada familia tour. It was the perfect amount of time and they were very organized. Neomi was a knowledgeable tour guide and made sure the group was together at all times. Awesome visit to La Sagrade Familia today. Part of the Sagrada Familia tour from Barcelona Guide Bureau. Our guide "Artur" gave us an audio tour of the bascilia. Showing us many of the special attractions Gaudi incorporated into his design. Both the Nativy & Passion entrances depicted many biblical scenes. The inside was breath-taking. The use of natural light filtering through the myriad of stained glass windows gave the basilica a special feel. The intricacies of the bronze doors, shell washbasins for baptism, the stalls that will hold over 1000 choirists etc. Each piece adds to the total awesomeness of the cathedral. No wonder, the spanish people are still working on it to achieve Gaudi's vision. Reviewed on tripadvisor by Leanne, from Sydney Australia.